Title: SLSF 3749 at Church Street Station, Orlando, Florida. Description: SLSF 3749 at Church Street Station, Orlando, Florida. Description: Church Street Station on a hazy afternoon. Description: At Church Street Station there is a steam locomotive on display. 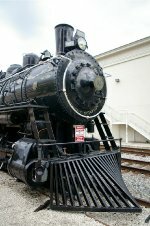 It was built in 1925 by Baldwin Locomotive Works for Frisco. It sits in Downtown Orlando next to Orlando's Second Railroad Station. The station is restored and is rented out to different stores. Description: This cute little 0-6-0 switcher is former Frisco #3749. She was built in 1913 by Baldwin. She is currently on display in Downtown Orlando, by the old Church Street station. She could use a bath, but is in decent cosmetic shape otherwise. Title: Ex Saint Louis and San Francisco Railroad (Frisco) Baldwin 0-6-0 Steam Locomotive No. 3749, "Old Duke"
Description: On display at the former Atlantic Coast Line Railroad "Church Street Station". Title: View of the former Atlantic Coast Line Railroad "Church Street Station"
Title: Former Saint Louis and San Francisco Railroad (Frisco) Baldwin 0-6-0 Steam Locomotive No. 3749, "Old Duke"
Description: The once thriving Orlando's Church Street Station has been home to the 3749 for years and it's starting to show. Description: Originally a Frisco steam engine, the 3749 was previously on display at the Church Street Station in Orlando. Title: A conversation between 2 engineers. Description: My Deddy talking to the engineer about the 8330.